My best friend, Leslie, and I went to Switzerland a few years ago where we visited her aunt. She offered up these cookies for us, and Leslie and I were addicted. I think we ended up eating about a box of them a day! I’ve always wanted to try to figure out how to make them, but never got around to it. Until the other day when I made steak and ale pie for dinner. I had some leftover puff pastry from the pies, so I decided to try whipping up a batch of these. They were super easy to make, and ready to eat in about 45 minutes. Fortunately I was able to use some restraint this time around and I left a few for Ben to eat. 1. Dust your worktop with a layer of regular ol’ sugar, then place your puff pastry sheet on top. 2. Dust the top of the puff pastry with a generous coating of sugar. 3. Roll up the long edges of the sugar-coated pastry until the two spirals meet in the middle, then wrap the roll in a sheet of wax paper or plastic wrap. Place the roll into the fridge to chill for about 30 minutes. 4. Take the pastry roll out of the fridge and slice it into 1/4-inch thick pieces (about 1/2 a centimeter). 5. Place each sliced cookie onto a baking sheet lined with baking paper, and place in an oven preheated to 400°F (200°C) for about 15 minutes. Your cookies are finished when the edges have turned a wonderful caramel color, but the middles are still relatively light in color. And that’s it! Quick. Simple. 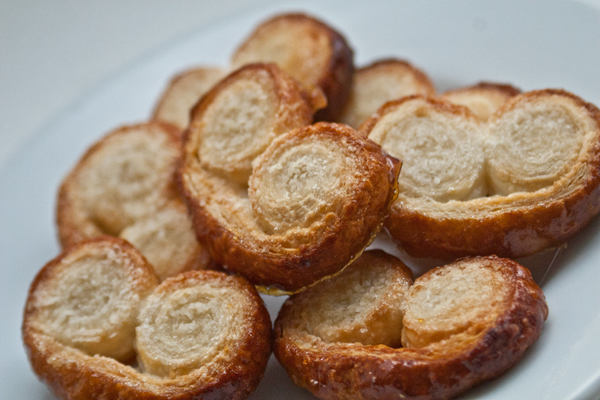 And a great way to use leftover pastry! Thanks, Granny! Will try that next time!